HUNTSVILLE, AL--(Marketwired - Oct 9, 2013) - Conversant Bio, a global leader in supplying the highest quality human tissue and viable cell samples, today announced it is publishing a new E-book to assist researchers in looking for FFPE samples for their drug discovery and biomedical research efforts. 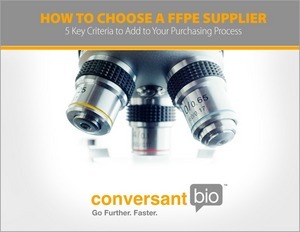 The E-book, How to Choose an FFPE Supplier: 5 Criteria to Add to Your Purchasing Process, is available for free download on the company's website at: http://www.conversantbio.com/free-ebook-how-choose-ffpe-supplier. FFPE tissue specimens provide a sizable information source for large-scale drug discovery research and biomedical research efforts. Indications include biomarker identification/validation, genetic studies, and visualization of tissue structure. FFPE tissue samples are important for ongoing studies involving many types of cancer, including breast, lung and colon cancer as well as inflammatory diseases such as rheumatoid arthritis and systemic lupus erythematosus (SLE). With an extensive in-stock inventory of FFPE samples, Conversant Bio offers researchers access to highly annotated, ethically collected, U.S. sourced materials to move early-stage research projects further, faster. In this new E-book, Conversant Bio offers researchers a five-step checklist to add to their FFPE purchasing process, five clinical indications for using FFPE tissue samples, information about current research using FFPE samples and their implications, as well as more about the patient treatment and how it affects their research efforts. The guide also shares a seven-step solution process that will help scientists obtain the highest quality specimens for their research. "Utilizing top-quality, carefully-sourced FFPE tissue for research can help move biomedical research forward and ultimately provide new and better treatments for many devastating diseases," says Luke Doiron, Chief Commercial Officer for Conversant Bio. "Our mission with this new E-book, is to offer researchers valuable information that can help simplify and advance their efforts." For additional information about this new E-book or Conversant Bio's services, please visit the company's website at http://www.conversantbio.com. Conversant Bio provides researchers around the world with hyper-annotated tissue samples in order to conduct informed, cutting edge investigations into many of today's most problematic diseases. With a large prospective collections network of 36 U.S. based clinical sites, and an IRB reviewed chain of custody Quality Control System, Conversant Bio provides you with the highest quality samples on time, and on budget. For additional information about Conversant Bio's services, please visit the company's website at http://www.conversantbio.com.